Weddings are filled with details. That, and a couple stressed out, usually adds up to just a small amount of totally-preventable chaos. I'm a problem solver by nature. That means that on the wedding day I do far more than just take photos. I've sewn bridal dresses, fixed bouquets, and I'm the one who puts the boutonnieres 90% of the time. Some friends even say that I should start a Wedding Planning business, but I enjoy capturing the memories too much for that. Being in the spotlight of the action, I'm always the first who notices or experiences most of those little mishaps throughout the day. So I decided to compile a list of the things that are most likely to never make it to the ceremony, needed essentials that are seldom packed in the day-of bag, and things that everyone should have at their event. Feel free to bookmark this post, since I'll probably be updating it Saturday after Saturday, as my anecdotes continue to pile up. This sounds like common sense, but it's one of the most forgotten details on a wedding date, and more than once I've ended up carrying a couple of bridesmaids in my car, which is also full of photo equipment. If you're having separate venues for your wedding, remember to do the car seat count before having your bridesmaids come over to your getting ready session. Also, some couples go to the airport directly from the reception venue, so make luggage transportation arrangements beforehand. I don't know what is about the bridal veil, but it is the most forgotten bridal accessory on many weddings! About 10% of these items never make it to the ceremony venue, because the bride leaves it at home. Remember to pack the veil, or put it alongside the dress so they remain together! Most wedding dresses come packed in the ugliest, least-photogenic hangers ever. Make sure you bring a good-looking hanger for the dress, it will do wonders! If professionally made, boutonnieres are usually handed on the wedding day along the bouquet. If bride & groom are staying at the same venue for their preparation, have someone assigned to carry and put the boutonnieres right away. If not, they might be forgotten! Feminine hygiene: pads, tampons, etc. Picture this: It's your wedding day, and, along with all the last-minute troubleshooting calls and text messages, EVERYBODY is excited and sending their congratulations on Facebook, Instagram, and whatnot. Those are a lot of notifications, and even the best cell phones might not make it to the ceremony. Always have your vows written on paper, along with any details you may need to retrieve from your smartphone throughout the day (ie: vendor phone numbers, wedding itinerary, etc). Oops! Always check with your cake vendor, venue, or caterer to check if they bring their own cake cutter. If not, you might need to bring it! Puerto Rico is beautiful. 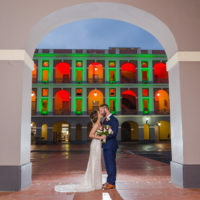 It is the perfect destination for a wedding all year round. However, being awesomely close to the Equator, that means we have high temperatures most of the year. Most of my weddings are held outdoors, which means that along with a nice backup plan in case it rains, you need to make your guests feel comfortable and fresh during the event. Paper fans, and water/lemonade booths are quite welcome by guests, and should be on your list. What other stuff have you seen/heard that should make it into this list? Help a fellow bride by commenting below! Hope this has been helpful!